Service Rank and Number / Rheng gwasanaeth a rhif: Private No. 29640. 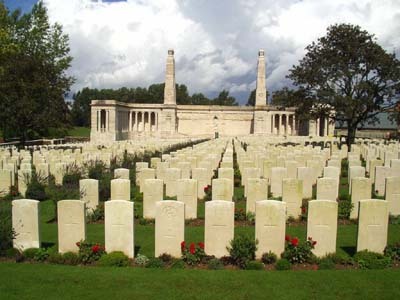 Military Cemetery/Memorial / Fynwent milwrol: Vis-En-Artois, Pas de Calais. Ref No Grave or Memorial / Rhif cyfeirnod bedd: Panel 6. Killed in action during the Battle of the Somme, aged 21 years. Thomas Grainly was born in Rhyl, Flintshire during October 1898. The 1911 Census shows that the family lived at Foregate House, The Roe, St. Asaph, Flintshire. The head of the family was William John Foulkes (Thomas’s step-father) aged 40, who was employed as a Roadman. His wife Mary Elizabeth Foulkes (Thomas’s mother) aged 43. Thomas Grainly aged 13, Edith Foulkes aged 4 and Cyril Foulkes aged 2 years. They later moved to 46 Ernest Street, Rhyl, Flintshire. Nothing is known of his early life, but on 1 February 1916 he enlisted at the Recruitment Centre, Denbigh, Denbighshire with 16th Battalion, Royal Welsh Fusiliers. The spelling of the surname Grainly has been made a number of ways, by the National Census Enumerators, Military and Commonwealth War Graves Commission in respect of Thomas Grainly. However, I feel it safe to assume that the spelling of the name on the Flintshire Roll of Honour Card, which was competed by Thomas’s mother to be the correct one. On 18 February 1919 and 16 May 1919, payments of £9.11s.7d and £3.12s.3d were made by the War Office to Mrs Mary Elizabeth Foulkes, being monies owed to her son Thomas. On 7 December 1919, a further payment which is recorded as a War Gratuity of £9.10s.0d was also made to her. There is a Flintshire Roll of Honour Card for Thomas Grainly at the County Archives Office, Hawarden which is dated 16 September 1919 and completed by Mrs Mary E Foulkes (mother). He is also remembered on a Remembrance Plaque, which is situated in The Royal Alexandra Hospital, Marine Drive, Rhyl, Flintshire and on The North Wales Heroes Memorial Arch, Deiniol Road, Bangor, North Wales.